“I don’t like the way Charlie is doing it”. THIS POLITICALLY-MINDED Donegal lad must be happy enough with the current government if his allegiances still lie the same way. 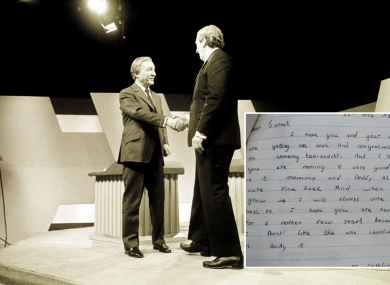 Young Vincent from Ballyshannon put pen to paper in May 1984 congratulating Garret FitzGerald on his job as Taoiseach. FitzGerald became Taoiseach for the second time in 1982, taking over from Fianna Fáil’s Charlie Haughey. … for another few years, because I don’t like the way Charlie is doing it. I hope you and your wife are getting on well and congratulations on comeing taoiseacht. And I think you are making a very good job in it. Mammy and Daddy always vote Fine Gael and when I grown up I will always vote Fine Geal to. I hope you are taoiseacht for a nother few years because I don’t like the way Charlie is doing it. Email “A Donegal child wrote a letter to Garret FitzGerald in 1984 having a sly dig at Charlie Haughey ”. Feedback on “A Donegal child wrote a letter to Garret FitzGerald in 1984 having a sly dig at Charlie Haughey ”.